To one as young as I. Look me straight in the eye. Grows paler than this cold, cold clay. There’s no need to hesitate. In the wrong time, in the right place. Be calm. but be ready to fight. 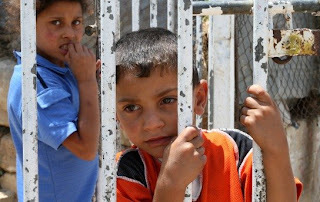 Photo shows children in Gaza. According to the BBC, conditions there are now the worst for over 40 years and the Israelis are threatening 'a holocaust'.